When I was a kid, there wasn't a Toys Я Us anywhere nearby - the nearest was about an hour's drive away - so I didn't think of it as a real store, but more of a far off magical place, like Disney World or Narnia. And yet FAO Schwarz, supposedly the toy store of toy stores, I'd never even heard of until it was featured in Big (and even then I didn't realize it was supposed to be a real place). That, kids, is the power of an advertising budget. I did eventually get to visit an FAO Schwarz, and rather than some kind of toy nirvana [you rang, Mrs. Addams? --ed. ], I found a perfectly prosaic toy store, an oversized, glorified KayBee Toys, with the ridiculously high mark-ups to match. But as a toy collector, it's nice to be able to say I went there, even if I never bought anything. And it's also nice to be able to own a representation of the store, even if I didn't get it there. 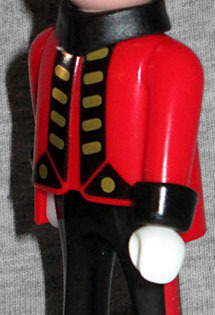 Last year was FAO's 150th anniversary, and Toys Я Us (having acquired the failing company in 2009, and chosing to maintain the flagship Fifth Avenue store while setting up FAO-branded zones in TRU stores throughout America) offered an exclusive Playmobil figure based on the iconic FAO Schwarz toy soldier. "I have made toys my life study... there is solid satisfaction in dealing with childhood playthings and in knowing of the joy one is sending out into the hearts of the little ones..."
The plain Playmobil figure, which fans call a "klicky," stands 7.5 cm tall - that's about 2.95", in a real system of measurement (also known as 212.6 typographical points, 17.72 picas, 0.164 cubits, or 0.044 smoots). Like Lego minifigures, they all share a generic smiling face (there's a lot more variety these days, but we're talking about the classic, here). This isn't exactly a plain figure, though: his costume is created by more than just paint. His torso is a "jacket" piece, with a clearly defined gap in the front between the lapels, snap-on cuffs at the wrist, and a separate collar that's only coming off if you pull the head out of the torso. Additionally, rather than having smooth legs, they're molded with pleats down the front. His jacket is red and his pants are black. He's wearing white gloves. There are red stripes on the outside of his legs, and gold detailing on the black lapels of his coat. It's not an exact copy of the FAO Schwarz soldiers' uniforms, but you get the idea. 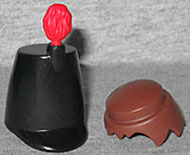 His big tall hat is removable - one thing that Playmobil has over Lego is that the hats plug onto the hair, rather than directly onto the head. Sure, that means the hair has a weird angle to it, but it also means that the character doesn't have to look bald if he's wearing a cowboy hat. There's a little puffball or feather or whatever on the top of the hat; it's a separate piece, but there's no benefit to removing it. 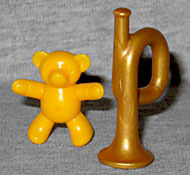 In addition to the cuffs, hat and feather, the FAO Soldier comes with two accessories: a golden trumpet and a yellow teddy bear. They're simple pieces, but they're good choices. 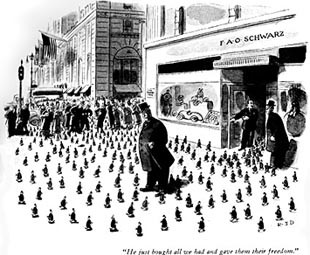 After all, they're both the sort of old-fashioned toy that fits FAO Schwarz's carefully manicured image. The toy can hold both of them. 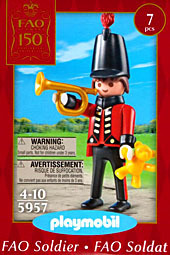 The FAO Schwarz 150th Anniversary Playmobil figure was originally given away free with a purchase from Toys Я Us' "FAO Boutique" - and in true FAO Schwarz fashion, it was some ridiculously high dollar amount before you could get one. Like $50 or something. TRU then sold them by themselves for $4.99, and in true TRU fashion, bumped the price up to $6.99 after the first batch sold out. Everybody gets to show off their bad business practices with this one! But getting a toy of a toy store mascot is a very cool thing. Not that there are a lot of toy store mascots, but you know what we mean. It's a nice display piece, kind of like owning a toy of a toymaker or a director, but because it's Playmobil, you know it's also going to be a quality toy.